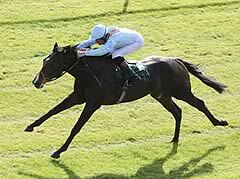 Toormore extended his unbeaten record to four with victory in the Novae Bloodstock Insurance Craven Stakes at Newmarket. Richard Hannon's colt, champion two-year-old last season, was carrying a 3lb penalty for his Group One success in the National Stakes and was handy throughout under Ryan Moore. The Grey Gatsby kept him company up front and was his only serious challenger inside the final furlong, but connections will have been pleased with the way he knuckled down close home to win by two lengths as the even-money favourite. Luca Cumani's Postponed caught the eye finishing well into third, but the big disappointment of the race was Godolphin's Be Ready. Well supported throughout the day, he never looked happy at any stage in the hands of Silvestre de Sousa and finished tailed off. Hannon said: "He idled a bit and had a lot of daylight but every time Ryan gave him a kick he went on. He's not a flashy horse and he was never going to come here and win by six lengths even if he could. "He is going to give the owners a lot of pleasure, has come here and won his trial and goes to the Guineas with a very good chance." Ahead of the field. Not a single losing month since inception. The Craven Stakes is named after William Craven, 6th Baron Craven, a member of the Jockey Club in the 18th century. His support for racing at Newmarket led to the introduction of the Craven Meeting in 1771. The first race had a subscription of 5 guineas, to which 21 subscribed. It was to be run "from the ditch to the turn of the lands." The race was won by Pantaloon, owned by a Mr Vernon. Fourteen horses had taken part. An open-age version of the Craven Stakes was staged annually until the 1870s. It traditionally took place on a Monday in April, and was usually Newmarket's first race of the season. Several other venues had a race of the same name. The present race, a one-mile event for three-year-olds, was established in 1878. The inaugural running was won by Thurio. The modern version of the Craven Stakes can serve as a trial for the 2,000 Guineas. The first horse to win both races was Scot Free in 1884. The most recent was Haafhd in 2004. The Craven Stakes is currently held on the second day of Newmarket's two-day Craven Meeting.